Made in the UK – False dawn or true revival? There has long been talk of bringing textile and apparel manufacturing back to the UK and the debate goes on. While education, cost, and compliance are key factors to consider, the consensus is that while garments can be made here, production is likely to be on a much smaller scale than back in its heyday. According to Adrian Elliott, president of apparel and footwear at industrial thread, yarn and zip specialist Coats Plc, the return of textile and apparel manufacturing to the UK is neither a false dawn or true revival. "I think it's somewhere in the middle," he says, adding: "Generally, I would say it's going to be very difficult to establish a large manufacturing base in the UK." Sourcing consultant Philip Worrall supports this view. 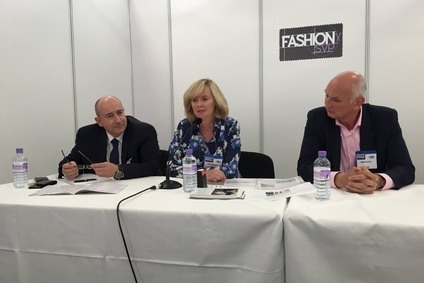 "It's a niche industry in the UK," he said during a panel discussion at last month's Fashion SVP nearshore sourcing event in London. While it's important "we keep it", Worrall believes there is an opportunity in the UK to "skill up" people that could then go into the wider industry. "At the moment, one of my biggest headaches and, I think [for] the industry as a whole, is a real skills shortage around garment and fabric technicians." He suggests that maybe by keeping it as a niche industry in the UK, it can filter or feed through to the larger sector so workers can take best practice offshore to factories overseas. "Maybe there's not necessarily just a false dawn or a true revival, but maybe there's an opportunity to educate our industry that is missing these people because the universities have no longer got those courses running," Worrall explains. Jenny Holloway, CEO of not-for-profit social enterprise and garment manufacturer Fashion Enter, which runs a fashion technology centre and apprenticeship scheme in the UK, says: "We shouldn't be afraid of bringing in new skills and really pushing it to the forefront of manufacturing." She adds: "It's about getting to market as quickly as you can with the best well-made garment. It's here in the UK." While these skills initiatives are key, Elliott believes it's a question of scale. With China's FOB ('free on board' or export prices excluding shipping charges) exports of apparel at US$175bn and Vietnam's at around $23bn, he points out: "Everything is a question of scale". "I agree that there is a future for an industry here, I just don't think it's going to be in the same bracket as places like Turkey or Vietnam or Bangladesh or Mexico and Central America." Experts look at the needs of the textile and apparel industry in five ways: speed, cost, innovation, quality and compliance, according to Elliott. "Everybody looks at those five needs, and they're trying to balance between them." While speed is an advantage for companies looking to manufacture in the UK, he believes the industry could look to innovate. "Speed and innovation are two areas where the UK could compete, I just don't think it's going to be $10bn of stuff," Elliott says. Worrall concurs, noting: "I'd love to bring it back to the UK, but let's be real. The likelihood of it happening in sizeable volumes and chunks is very minimum." He adds: "What we've got here is a great opportunity, and yes we should encourage it and push it to flourish and grow in the UK. But I think retailers are going to be under huge margin pressure in the coming months, particularly on [the UK] minimum wage, and it will focus their minds on margin and make it harder for them to make this decision to make in the UK." When margins are squeezed, Worrall believes retailers have got to think more about where they're going to be sourcing their products from. "You are going to be looking at any countries where you can reduce any import charges, such as Bangladesh, Vietnam, Cambodia; you're going to be looking at and focusing on those markets where you can produce and get your goods at a cheaper price than, sadly, we can make it in the UK," he says. Comparing labour costs in the UK – GBP400 (US$608) a week – to those in Bangladesh – US$60 a month – Worrall reiterates that nearshore manufacturing is about scale. "We're not talking about making 200,000 garments a year," he explains, adding that one factory he visited was producing 1m garments a month in one style. But Holloway believes brands and retailers need to take into account costs associated with quality control, transport and reprocessing. "All that will be obliterated by actually making in the UK, and that's what you should be doing," she told the audience. Worrall, however, points out: "We're in a consumer society today. Sadly, it's cheaper for someone to buy a new T-shirt than it is to get it laundered...that's cheap product coming from Asia. How long can we sustain that? I don't know." After the Rana Plaza factory collapse in Bangladesh killed over 1,100 people more than two years ago, Holloway says she has "spent a fortune on compliance, but it was the right thing to do". Indeed, her factory has developed a barcode system which sees machinists scan in and scan out, with every operation timed so she can compare the cost of production from one worker to another. "Then you haven't got that headache about is it being subcontracted out to a third party that you do not know it's being made at," she explains. Holloway adds: "If we're going to have an industry to be proud of, well then let's do it and do it properly."